The author, who may be reached at Robert.Avery@express.co.uk, has kindly shared his history of the Risorgimento on his website with readers of the Victorian Web. The copyright for text and images of course remains with him. hen France and Napoleon were expelled from Italy at the end of the Napoleonic Wars, the various Italian states were largely returned to either their Austrian (Hapsburg) or local royal family rulers (including the Pope in the Papal States). Both the Austrians and the traditional monarchs were generally eager to return the States to an almost feudal political system and isolation from the rest of Europe. The States had, however, tasted reform and the modern world under the French, and calls grew either for a change from traditional monarchy to constitutional monarchy or for the disparate states of Italy to unite as one nation. 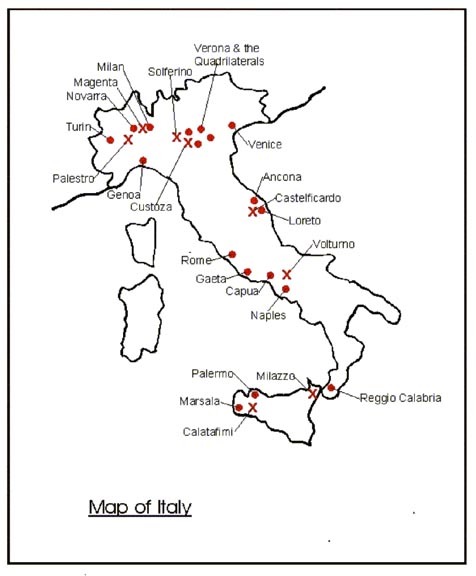 Map of Italy with sites relevant to the Wars of Unification. © Robert Avery. The Italians were, however, beset by political turmoil: for example, the question of whether Sardinia was actually fighting for a united Italian republic or a united Italy ruled by Sardinia. Not only this, but they were a volunteer army run by untrained aristocrats and had been raised with no preparation of supplies. They were also fighting one of the most professional armies of Europe on, effectively, that army's home ground. Although Peschiera was captured, the Austrians, under the experienced Radetsky, received reinforcements by forced march from Vienna and, at the same time, Naples, the only other Italian state with a 'regular' army, withdrew from the war. A four day battle on 22-25 July at Custoza led to the first proper Austrian victory: with the Italians fighting bravely but being defeated almost by the Austrians' superior training and staff work. On the fourth day, for example, the Italians were exhausted and out of supplies, whereas the Austrian units facing them had been properly rotated with their reserves and were therefore relatively fresh. In Rome, however, the Pope (known as Pio Nono, and even more reluctant to reduce his absolute secular authority than the Austrians) had been expelled by republicans: who had declared the Papal States to be a new Roman Republic. This was a more significant act for the rest of Europe than a mere rebellion: it was a slap in the face for Catholics in general. For a month the great Catholic European powers (Spain, France, Austria) argued amongst themselves about what to do until eventually, seizing the opportunity to make a name for himself, Louis Napoleon (who would become by coup d'etat Napoleon III) sent 10,000 troops under Oudinot to capture Rome and restore the Papacy. The Roman Republic's army consisted of a mish-mash of volunteers from all over Italy including, obviously, Garibaldi and his Italian Legion of 1300 men. Incredibly this rag-tag volunteer army held off the French for two months of fierce, often hand-to-hand, street fighting. The French, determined that they would not be beaten, sent reinforcements until eventually, they had 30,000 men besieging Rome and, on 30 June, the city surrendered. 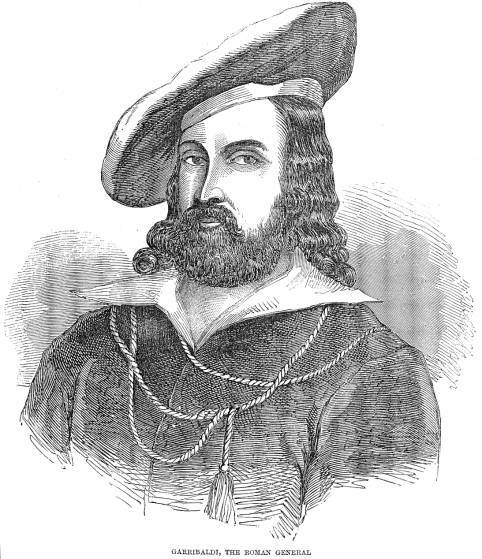 Garibaldi escaped, however, and began ' the retreat from Rome': in terms of providing a focus for Italian republicanism almost more of a victory than the unsuccessful defense of the city itself. 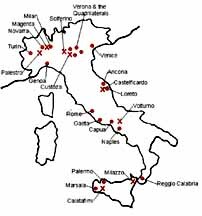 Meanwhile, the Sardinian defeat at Novara released Austrian troops for Radetsky to use to crush the Venetians. Protected by its geography, the fight for the city centered around the forts of Malghera and Chioggia (the Forte di Brondolo). After Malghera was abandonned by the Venetians in May, the city held out until August: when its people were forced to capitulate by a combination of disease and starvation. With the fall of Venice, the First War of Italian Unification was over.